All in all, this cake took me one full evening and another half day the next day to complete. Yes, sweat! I cheated and bought an interesting couple of cake pans from B-I-Y. They were designed in such a way that you can get a filled cake in the shape of a heart on the inside. Ok, I've lost you...please refer to iPhone pictures above. Firstly, I bake 2 chocolate cakes in the specially shaped cake pans. While waiting for them to cool, bake another cake, this time a red velvet cake. Crumble up the red velvet and mix in some buttercream (again, I was being a smart arse and did this from scratch). Fill the cavities of the cooled chocolate cakes with the red velvet. Flip one cake over the other. MESSED UP! I didn't put enough buttercream to the red velvet so it was still crumbly and when I flip one cake over, some of the red velvet came loose and spilled out. Yup, I was mortified when that happened but there was no turning back. Next, ice a thin layer of buttercream over the entire cake, sort of like a crumb coat. Next, time to exercise. At least, that's what preparing the fondant felt like. I put in some food colour and started kneading and rolling out the fondant so that it's big enough to cover the entire cake. First two attempts the fondant tore as I tried to put it over the cake, third attempt was successful but trying to smooth the bottom edges was a disaster, some buttercream started oozing out and by then I had about enough and was ready to drive down to Awfully Chocolate and just get a damn cake. But my little boy wanting a blue cake was more important so I persevered and got something half decent after I cut off the excess fondant. Then I thought it looked kinda plain, so i cut out some triangles and rolled two strips of fondant together to form a bunting along the sides of the cake, pretty cute huh? ;) Idea not original of course, Google and YouTube were my assistant designers. For the finishing touch, I poked 3 meringues I baked for the party into 3 chocolate Pocky sticks and they sat on top of the cake. TA-DAH!!! OH, did you see the inside? When you cut open the cake, there's a red heart shape (the red velvet)! Of course the heart didn't look so good due to the lack of buttercream mixed into the red velvet, so the heart came crumbling out (like mine) :( Not nice? Well, my little boy loved it! That smile was all I needed to take the fatigue away and make it all worthwhile. Maryann, I totally hear you. I had just tried to make my 1st cake and fondant one too for my baby girl’s First bday. OMG...I totally have a whole new respect for the fondant cake makers. 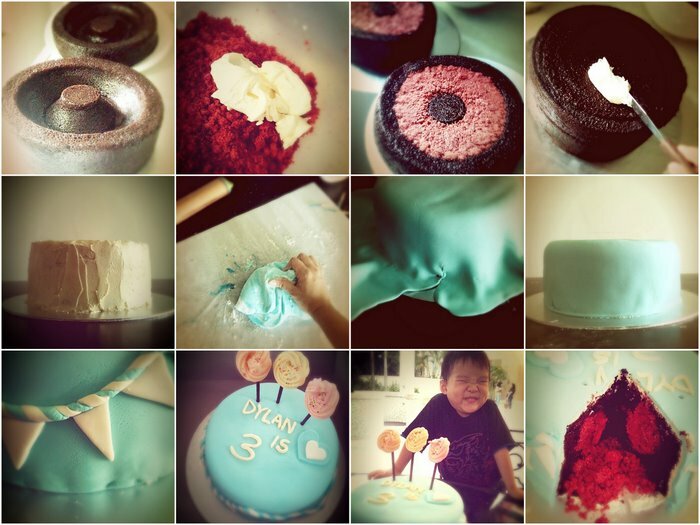 It’s not easy making it all fr scratch and kneading the fondant, mixing the colour with our bare hands. But just like you said, the happy smile from the kiddo’s face is all that matters. Gd job, Mom. Ur cake is beautiful..*pat pat. see you at the awards, too bad they don't allow kids otherwise i would love to meet your little girl. Oppsie...Juz remembered to return to check for your reply. I have not posted anything about me making the cake, though I had planned too. Hahaa...Gotta make time to do a re-post so I can show Allysa. EVIDENCE. lol...Yeah, it’s a pity there’s a age limit. Maybe they should make an exception for the Parent bloggers, yeah? But no worries, if you do ever need a baby girl for some photoshoot session, let me know, ok?? =) And I love ur photos. How nice to have a Mommy who is able to capture beautiful photos. Ooo...and yes, see you at the award!